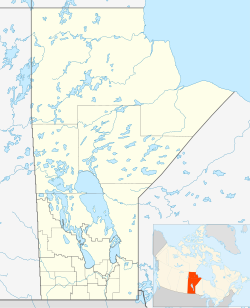 Oxford House is a First Nations Cree community in Northern Manitoba, located on the Oxford House 24 Indian Reserve.The community is located along the eastern shore of Oxford Lake at the mouth of Hayes River, 950 kilometres (590 mi) North of Winnipeg. The Hayes River was designated a Canadian Heritage River in 2006. The Bunibonibee Cree Nation have reserved for themselves 13 separate tracts, of which Oxford House 24 serves as their main reserve, containing the settlement of Oxford House. Oxford House was established in 1798 as a Hudson's Bay Company fur trading post on the fur trade route between York Factory on the Hudson Bay and Norway House some 30 km (19 mi) north of Lake Winnipeg. People from nearby areas moved to the trading site and formed the community of Oxford House. The United Church played a major role in the development of the community. The ministers and their wives were the first nurses and teachers. In 2016, N'we Jinan travelled to Oxford House and made two music videos with indigenous youth living there, When the Dust Settles and BoiDee. The two videos received attention from outside the community for the insight they offer into the problems facing youth living on remote reserves. The songs are included on the N'We Jinan album, Silent War recorded in Vancouver in 2017. Oxford House 24, IRI had a population of 1,864 in 2011 living in 335 dwellings on a land area of 51.01 square km. The median age was 21.4. Cree was selected as the mother tongue of 1,500 residents. Oxford House has a high school, elementary school, a pre-school (Head Start) an arena, a Northern Store with a Tim Hortons, a nursing station, a Royal Canadian Mounted Police detachment, the University College of the North Centre, an airport, a motel (Triple B), water treatment plant, band office, care home, medivac operation/emergency, youth building, a radio station, and a conservation office? The Oxford House Fire Hall was built in 2015. George Colon Memorial Home was built in 1988. The Outdoor Rinks were built in 2015. They are located on each end of the community. The outdoor rink is for everyone. There are 5 Churches in Oxford House. They are United Church, R.C Church, Niyahk Bible Chapel, Full Gospel, Pentecostal Church. The new addition of the Northern store officially opened in October 29, 2012. The Northern Store has its own grocery and retail section, along with its own Tim Horton express, and a post office. The newest business in Oxford House opened in January 2017, owned and managed by local staff. Super B's is a convenience store with a kitchen that provides a partial menu. The Oxford House UCN Centre opened its doors at 2015. Elementary School was built in 1974 and completed in 1975. ^ "Oxford House Census Canada data". Census Canada. Retrieved 2018-06-20. ^ "Canadian Heritage Rivers System (CHRS) Hayes River Map". Retrieved 2013-09-15. ^ "Manitoba Forts(Manitoba Historical Society)". Retrieved 2013-09-15. ^ "Methodist Indian Day Schools and Indian Communities in Northern Manitoba, 1890-1925 (Manitoba Historical Society) Manitoba History, Number 30, Autumn 1995". Retrieved 2013-09-15. ^ a b "Cree youth drop rhymes, shed light on life in Oxford House First Nation". CBC News Manitoba. Retrieved 30 September 2017. ^ Monture, Lindsay. "N'we Jinan Artists from Oxford House Manitoba Release New Video for "When The Dust Settles"". Revolutions per Minute: Indigenous Music Culture. MBM Digital. Retrieved 30 September 2017. ^ "First Nations youth launch album covering hope, challenges of living in remote communities". CBC News Manitoba. Retrieved 30 September 2017. ^ "2011 Census Statistics Canada". Retrieved 2013-09-15. ^ "Oxford House, Manitoba (outline of infrastructure)" (PDF). 2004–2005. Retrieved 2013-09-15. This page was last edited on 25 June 2018, at 07:48 (UTC).